First, let’s talk about the title: “For the Girl Who Has Everything” is an homage to “For the Man Who Has Everything,” a story by Alan Moore and Dave Gibbons in Superman Annual No. 11. It is widely accepted as one of the Best Superman Stories Ever, by two of the best guys ever to tell one — and it came out in 1985, just one year before the same writer/artist team would go on to make Watchmen, which is widely accepted as one of the Best Comic Books Ever. It’s because, with “For the Girl Who Has Everything,” Supergirl is effectively announcing that it wants to be the best damn Superman show out there — and although things are still kind of rocky, it just might pull it off. Over the first half of its debut season, Supergirl has mined and reworked lesser-known and weird aspects of the Superman/DC mythos, from Jimmy Olsen’s signal watch to Red Tornado and Bizarro. This is stuff that Superman movies, in the current Warner Bros. climate, would not even touch without relentless changes to make it all seem “badass” or some nonsense. Supergirl is grabbing it all and calling it season one. To be sure, the show has not yet arrived — something still seems slightly off, like an otherwise killer recipe that’s just missing one spice you can’t quite put your finger on. Maybe it’s urgency. Maybe it’s depth. We only see these characters in one job or another, and perhaps we’d care more if we saw more of their personal lives. Right now Supergirl is primed for efficiency, trying to fold everything into either CatCo or the DEO — two sterile, closed-off environments that don’t often let worlds collide in interesting ways. “For the Girl Who Has Everything” offers a tantalizing hint at how much fun it’ll be if (or when) things mix up more than they typically have, with James and Winn showing up at DEO HQ and Hank impersonating Kara at CatCo. There’s a lot more to talk about, but let’s touch on the plot, yeah? We pick up immediately after the end of last week’s episode … except we don’t really know that yet, because Kara wakes up on Krypton. Her family is all there, saying she’s been sick and hallucinated Krypton’s destruction. That’s not true, of course. If you remember, Kara was ambushed by a weird-as-hell parasite called the Black Mercy, which incapacitates its host by trapping her in an unconscious fantasy steeped in her heart’s greatest desire. For Kara, this fantasy is on Krypton, never destroyed, with her entire family together — even her little cousin, Kal-El. The Black Mercy is the work of Non, Astra’s militant husband, who wants Supergirl out of commission during a solar storm that interferes with global communications at just about every level, from cell-phone reception to clandestine government satellites. After Cat Grant notices Kara’s absence and refuses to buy any of Winn’s excuses — mostly because Cat believes she’s hiding after breaking her son’s heart — James and Winn call Alex, who also hasn’t heard from Kara. So they go to her apartment and find her unconscious, caught in the thrall of the Black Mercy. They don’t know that’s what it is yet, and in the meantime, Alex takes Kara & Co. to the DEO, much to Hank’s consternation. (He can’t stand to see civilians in his tree house.) They try just about everything to remove the Black Mercy, and it all fails. They only find out what to do because of Astra, who independently realized what her husband was up to and went to Alex with the truth: The only way to remove the Black Mercy is if Kara rejects the fantasy she’s being offered. The only problem? The longer Kara is under, the more she buys into her Krypton dream, and the less she remembers about her real life. She’ll need some help. And that help comes from Maxwell Lord, of all people. After being told that the aliens that attacked his lab were planning their next move, Lord agrees to rig up some sort of … I don’t know, psychic brain machine? Basically, it lets Alex slip into the fantasy unfolding within Kara’s mind and talk to her. It works, but not before Kara totally buys into the illusion. She doesn’t remember Earth, or Alex, or anything that isn’t this idyllic Kryptonian life. 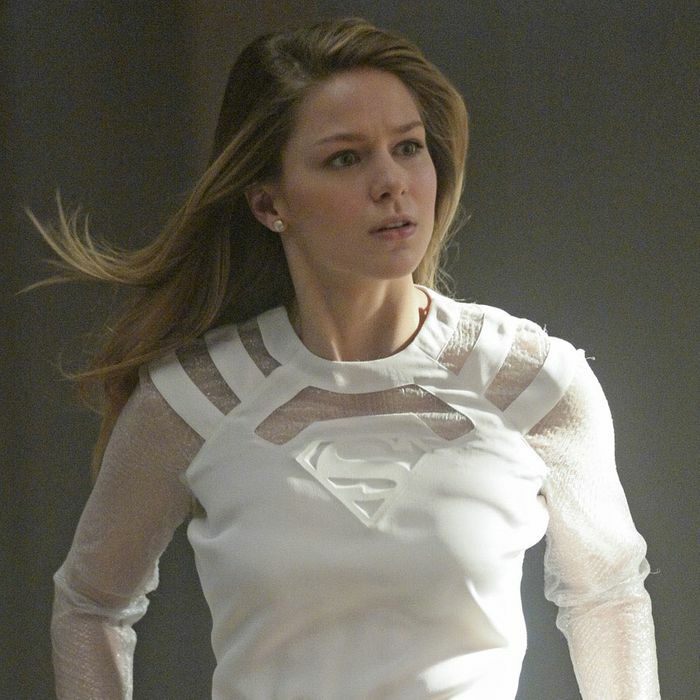 She knocks Alex unconscious, and when Alex comes to she’s in cuffs, standing in Kryptonian court, about to be sentenced to the Phantom Zone for being an alien spy. Now we’re going to pause again, and talk a little bit more about why Supergirl might end up being one of the best Superman stories a lot of people will ever see. The story of Supergirl and Superman is tragic as hell. It’s easy to forget because it’s the first thing that’s glossed over in their origins before we move on to the day’s action, but these are people who lost their entire world. That’s an immense amount of pain to carry, especially for Kara, who spent a significant amount of her childhood on Krypton. Supergirl hasn’t landed this emotional trauma too well, but so far, the overarching story of this show has been about a young woman who discovers that she’s not as alone as she believed. Sure, she has her paragon of a cousin out there, being a hero, but there’s someone else from home out there, too, and she’s freaking evil. Life isn’t perfect; I know it can be hard and it can be lonely, especially for you. You have lost so much … I can’t promise you a life without pain and without loss. Because pain is part of who we are. It’s what makes you a hero. This is one of the things that makes Supergirl and Superman such vital, enduring characters. They’re about fashioning hope from pain. They’re about how, sometimes, smiling is more heroic than lifting tons or punching bad guys really hard. And they’re about refusing to fixate on that pain, which is why the majority of Supergirl/Superman stories shouldn’t dwell on the gravity of that tragedy — and why stories like “For the Girl Who Has Everything” are so necessary. This episode is a reminder of everything these characters carry underneath the brightness, the weights they bear beneath their smiles. It’s not unlike the first time you get a glimpse of the flawed human heart that beats behind a role model. If these characters were missing their noble and heroic parts — the parts a kindly couple from Kansas might instill — all they’d have left is fury. Look at the unbridled rage Kara expresses when she finally recovers from the Black Mercy. Non, Astra, and their soldiers are striking Max Lord’s satellites in six different locations while the DEO splits up to try and stop their plan — which involves using the satellites for something called Myriad — and Kara cuts a path straight to Non and beats the hell out of him. He still gets away, though, because he endangers civilians, and because of what’s happening over on Astra’s end of things. It’s Alex’s job to stop Astra. She tries talking the Kryptonian down, but to no avail. The two fight, but Alex doesn’t really have a chance — not until Hank intervenes as J’onn J’onzz, which I still get the biggest kick out of seeing. He’s no match for Astra, though, and it looks like she’s about to kill him. Except Alex kills her first, with a Kryptonite sword. This is bananas. And I don’t know how I feel about it. She never stopped believing Astra could be saved. That’s the difference between soldiers and heroes … You are Supergirl’s hero. And I don’t want her to see you as anything other than that. I’m still not sure I agree with what’s happening here, but I appreciate the sentiment. The relationship between Kara and Alex is one of Supergirl’s strongest suits, and I hope they’re going somewhere good. But for now, that’s okay. Supergirl might seem a little bit silly, but it consistently and utterly nails the one important idea that should lie at the heart of everything it does: how to be a hero.